Brent Crow has fished his entire life in North Alabama and for the past ten years across the country in the professional ranks. He qualified for the BFL All-American as well as the Bass Federation National Championship before fishing the FLW Tour for three years. 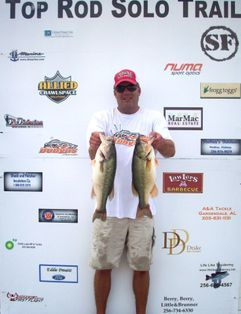 Brent is a full-time guide and tournament angler and won the 2012 Top Rod Solo Trail Angler of the Year title on North Alabama waters after finishing 2nd in 2011. In 2015 Brent finished in the top 10 in both divisions of the Alabama Bass Trail for the season. 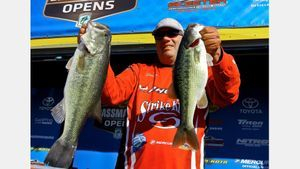 Most recently, he finished 2nd in the BASS Southern Open at Smith Lake in March, 2016. He has numerous tournament wins on all of the lakes he fishes: Guntersville, Wheeler, Wilson, Pickwick or Smith. Check out the recommendations page for real life unsolicited stories from Brent’s clients and friends and his fishing reports on the reports page. When you go on a guide trip with me, you will be going with a true professional fisherman. I am a United States Coast Guard Licensed guide with over 25 years of experience with the waters on which I guide. I have a solid track record in tournament fishing on these waters and a long list of happy clients. You will always go with me when you book a trip with me, I do not farm trips out to friends or part time guides. Guides are not all the same, so be sure that you check out the resume before you make the mistake of hiring a fly by night guide with little experience and no tournament track record. This is your trip, so my first goal is to make sure you are satisfied with your outing. Obviously, the goal of most trips is to catch big fish and lots of em, but as we all know, that is not always the case in fishing. That is the objective in every trip, however, and you can be assured that I will do everything I can to make your trip enjoyable whether the fish bite or not. Everyone is welcome - from beginning fishermen to seasoned pros. I can help you learn to cast a bait caster if you haven’t quite mastered it yet. I have equipment on board that everyone can use, no matter the experience level of the angler. I am also available for teaching or pre-tournament scouting trips where the goal is not really to catch as many fish as possible that day. If you want to learn to fish a specific bait, more about your electronics, how to read structure, or anything else that my experiences can show you, I will accommodate those requests as well. Don’t forget, fishing is fun! And I like to have fun. You won’t see any frowns or bad attitudes in my boat and hopefully you will come back for another trip regardless of the catching.